Every time there is a new launch from Bourjois, I am reminded of what a fab job this Parisian beauty brand has been doing for the past 149 years (it was started in 1863 by theatre actor and cosmetologist Joseph-Albert Ponsin). And while I know that it’s a super successful makeup company with a worldwide footprint, there is something about its products, imagery and colours that’s so reminiscent of niche French cosmetics made in charming country cottages with pastel blue window shutters and women in pretty floral sundresses who pluck fresh rose petals straight from the garden and brew them into the Little Round Pot Blush (which, incidentally, was the first dry powder blush in the world). Today, a century-and-a-half-later, Bourjois continues to create a seamless blend of tradition and innovation. Take, for example, the brand’s 1 Seconde Nail Enamel collection, which has recently debuted some striking gel-textured hues. I have always been a fan of these nail polishes because of their unique brush – its a bit shorter, flatter and stubbier than those of other brands and makes the polish go on beautifully and effortlessly, even in the hands of klutz like me. Seriously, it’s by far the easiest nail polish brush to control, with a long lid and tightly spaced bristles that paint on an even, streak-free layer of colour even when held in the left hand. I have been known to clean and use it to apply nail polishes from other brands… not kidding! And contrary to belief, that’s what the “1 second” refers to – the time it takes to paint one nail perfectly and not the drying time! But even the drying time is not bad – especially for the new gel-textured polishes that contain silicone. Silicone not only reduces the drying time to a couple of minutes but also creates scratch and chip-resistance, while giving a super-shiny effect. Though brand copy says you only need one coat of polish, I would personally go for two – as you can see below, the single coat looks a little light. The colour comes out darker than it appears in the bottle and has a smattering of gold shimmer that would look good right from an afternoon brunch to an evening cocktail. Another small detail – the bottle now holds 9ml of polish (earlier it was 8ml). Honestly to me this doesn’t matter that much as I have never ever managed to finish a whole bottle of nail polish in living memory… what about you? Do you manage to see through a nail polish right down to the last drop? 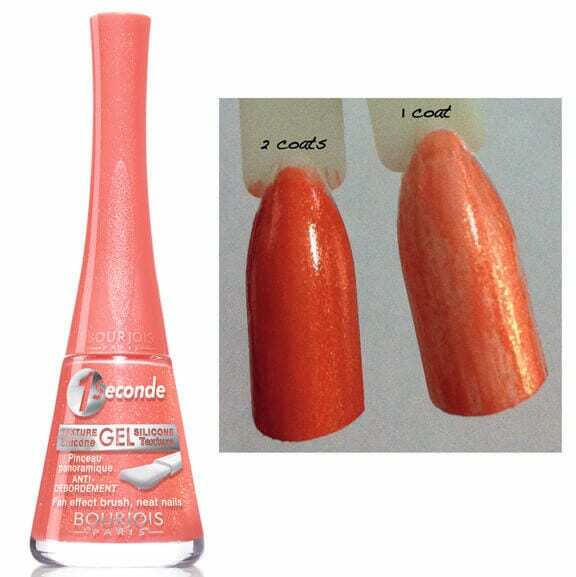 I would like to buy the nail polish Bourjois GEL SILICONE 1 SECONDE. I live in Varese (Italy). Would you please be so kind to inform me about where can I buy these products. 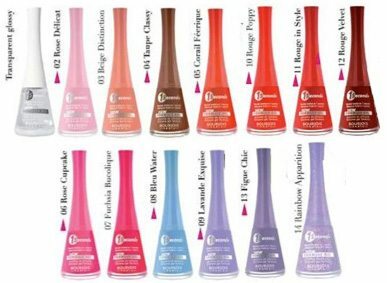 I am interested also about an web-site for shopping on line these nail polishes.